Almahmoud was bred in 1947 by C. V. Whitney in Kentucky. She was sold to Henry Knight as a yearling. This sale would be the first of many pertaining to Almahmoud, as she would change addresses frequently before landing a permanent home with D. G. Van Clief at Nydrie Stud in 1955. The dam of Almahmoud was the unraced broodmare Arbitrator by Peace Chance, a grandson of Fair Play and winner of the 1934 Belmont Stakes. Arbitrator was out of Mother Goose by Chicle, a son of Spearmint. Mother Goose was the champion two year old in 1924. Knight would sell Almahmoud to T. D. Taggert soon after acquiring the filly, at the Saratoga yearling sales, where she brought a final bid of $15,000. Taggert passed away shortly after this sale so, Almahmoud would enter the sales ring again in the dispersal of Taggert’s stock. William Helis would purchase her, the price being $15,000 again. For Helis, Almahmoud would race as a two year old and at three, winning the Colleen Stakes as a juvenile and the Vineland Handicap the following year. Helis passed away and so Almahmoud would be changing barns again, this time as part of a dispersal package costing $1,000,000, to Henry Knight, the original purchaser of Almahmoud from her breeder. She was retired from racing by Knight and bred to Cosmic Bomb, winner of the Arlington Futurity and Cowdin Stakes at two, adding the Lawrence Realization and Discovery Handicap among his five stakes victories as a three year old. The resulting foal of 1953 would be Cosmah, winner of the Astarita Stakes. Cosmah would produce fifteen foals in her highly productive broodmare career. Cosmah is the dam of Tosmah by Tim Tam, champion three year old in 1958 after winning the Kentucky Derby, Preakness Stakes, Flamingo Stakes and Florida Derby etc. Tosmah herself would be a champion two year old winning seven of eight races including the Frizette and Astarita Stakes. She would go one better as a three year old being named champion filly of her age and as champion handicap female as well. Tosmah won the Beldame Stakes, Arlington Classic, Maskette Handicap, Arlington Matron Handicap and Colonial Handicap during her three year old season. She would continue racing at four and five winning Maskette Handicap a second time at four, and the John B. Campbell and Barbara Fritchie Handicaps at five. Cosmah would produce; Father’s Image (City of Miami Handicap) by Swaps; Maribeau (Fountain of Youth Stakes) by Ribot; Halo (to be highlighted in a separate post) by Hail to Reason; Perfecta by Swaps would be the dam of Suprina by Vaguely Noble, who in turn would produce champion French miler L’Emigrant (Poule d’Essai des Poulins, Prix Lupin) by The Minstrel. Another meeting for Cosmah with Ribot would produce a filly to be named Queen Sucree. Queen Sucree would be the dam of stakes winners Wassl Touch by Northern Dancer, as well as Circle Home, Del Sarto and Cannonade by Bold Bidder. The latter would win the Kentucky Derby and then go on to sire Caveat (Belmont Stakes). Queen Sucree is also the dam of Kennalot by Gallant Man, dam of Stephan’s Odyssey (Hollywood Futurity, Dwyer Stakes etc) and Lotka (Acorn Stakes). Almahmoud would be sold again in 1955 when Henry Knight became ill and dispersed his stock. He advised D. G. Van Clief to purchase Almahmoud telling him” this is a mare you should have”. Van Clief, a lifelong friend, heeded the advice and purchased Almahmoud with a final bid of $57,000 at the dispersal auction. Finally Almahmoud had found a permanent home as she would go to Nydrie Stud, in foal to Citation, and would live the rest of her life here. The Citation foal would be a modest winner of three races from seven starts as a gelding, but from a cover by Native Dancer, she would in the following year produce a bay filly. Sold at the Saratoga yearling sales in 1958 to E. P. Taylor, the filly fetched $35,000 and was sent to Windfields Farm in Oshawa to be broken and prepared for racing. She was given the name Natalma and would become one of the most revered names in Thoroughbred history. Natalma showed speed and class as a racer but had issues with the sting of the whip and would duck out when the stick was applied in a race. This would cause her to be disqualified from her victory, and placed third, in the Spinaway Stakes. She would develop calcium chips in her knee early in her three year old season and was subsequently rushed to stud late in the breeding season to Nearctic. The following year she would present the Thoroughbred world with a small bay colt with a crooked blaze down his face that would change the direction, and mindset of breeders towards height challenged stallions forever with her first foal, his name being Northern Dancer. After foaling Northern Dancer, Natalma would produce thirteen more foals, three of which were stakes winners, Native Victor by Victoria Park, Regal Dancer by Grey Monarch and Born A Lady by Tentam. Four were stakes placed, Nostrum by Dr. Fager, Tai by Buckpasser, and Northern Native and Arctic Dancer who were both full siblings to Northern Dancer by Nearctic. Arctic Dancer would become the dam of the great La Prevoyante by Buckpasser. Natalma would also be the dam of two daughters who would produce influential dams of future successful sires. Raise The Standard by Hoist The Flag would produce Coup De Folie, a graded stakes winner in France, by Halo, which makes her inbred 3×3 to Almahmoud. Coup De Folie would in turn produce Exit To Nowhere (Prix Jacques Le Marois) by Irish River and Machiavellian (Prix Morny, Prix De la Salamandre etc) by Mr. Prospector. The latter was a leading sire who’s son Street Cry is one of the top sires in the world today. A full sister to Machiavellian, Coup De Genie, would emulate her brother by winning the Prix Morny and Prix De la Salamandre as well as the Prix Cabourg to be named the 1993 champion two year old in France. Coup De Genie is also the dam of Denobla (Prix du Marcel Boussac) and multi stakes winning gelding Snake Mountain. The other daughter of Natalma to make a lasting mark in Thoroughbred pedigrees is Spring Adieu by Buckpasser. Spring Adieu would be the dam of Razyana by His Majesty, the dam of six stakes winners, Euphonic by The Minstrel, and five more all sired by Danzig. These foals would be the filly Harpia, and colts Eagle Eyed, Shibboleth, Anziyan and Danehill. The last named is very familiar to Thoroughbred followers worldwide (to be highlighted in a separate post). The enormous contribution by Natalma to Thoroughbred breeding has been quite astonishing. 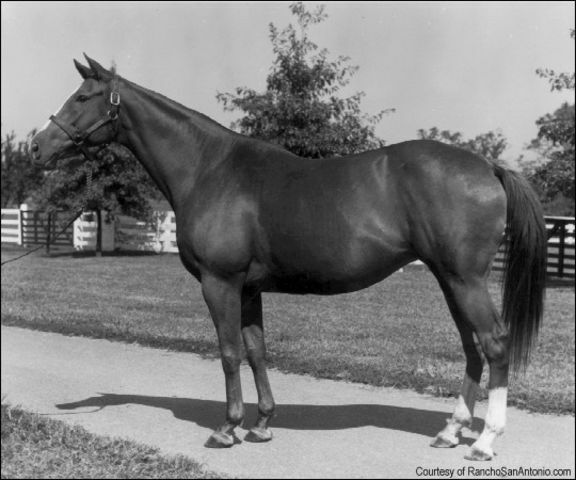 Almahmoud would in 1959 produce a full brother to Natalma, a minor stakes winner named Folk Dancer, followed by Nash, a multiple winning gelding by Nashua in 1960 and then in 1961 she would produce a third daughter, this time by Hasty Road, that would become the dam of another successful sire. The name of this filly would be Bubbling Beauty. Bubbling Beauty had no success on the track, running unplaced in two starts, but more than made up for this by producing Arctic Tern by European Champion Sea Bird II. Arctic Tern would win the Prix Ganay before he went to stud in France, later to be relocated to Lane’s End Farm in Kentucky. Arctic Tern would become the leading sire in France three times and among his get would be; Bering (Prix du Jockey Club); Escaline (Prix de Diane); Harbour (Prix de Diane, Prix Saint-Alary); Suave Tern (Premio D’Italia); and Intemiste (Criterium de Saint-Cloud). Almahmoud would have fertility problems later in life, as she would not come into foal for five years until she produced her final foal Ramadan by Native Dancer, who won only one race. She was bred twice more after but did not conceive so was consequently retired from breeding. She developed navicular disease a couple of years before her passing in 1971. Although she was somewhat high strung during her racing days, she became a rather docile mare, motherhood seeming to calm her, and is remembered as a lovely mare to be in the company of. She is also importantly remembered as one of the key broodmares for today’s Thoroughbred champions.